Genie has designed a new consolidated maintenance protocol that enables customers to complete the entire program for all Genie® S- and Z- boom lift models in less time. With this new approach, maintenance procedures are reduced, or even eliminated, to save time and labour costs, according to Mitch Ely, National Operations Manager, Terex AWP. 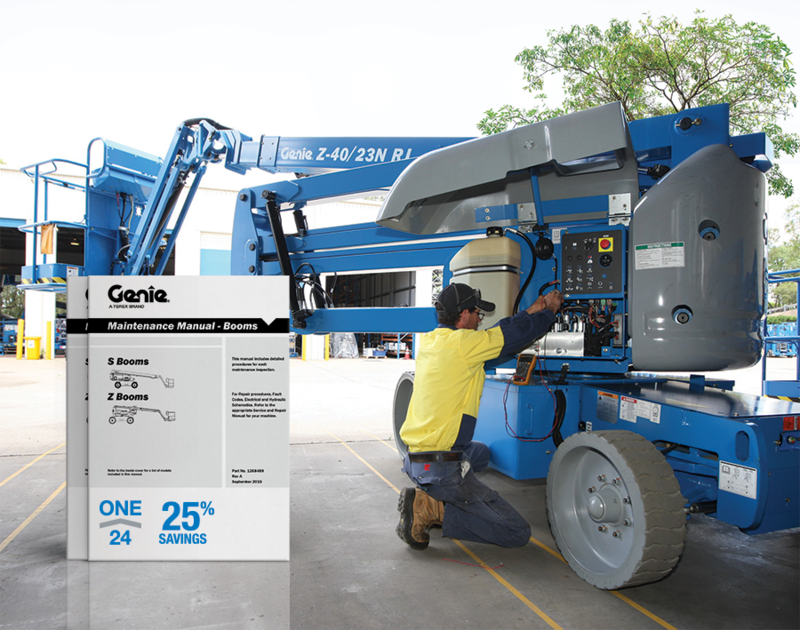 Previously, Genie offered 24 separate manuals to help customers maintain their boom lift equipment. With the new maintenance protocol, all of this information is condensed into one, easy-to-use manual. The one-stop maintenance manual, which comes in hard copy and digital format, contains complete performance specifications, and a streamlined list of maintenance tasks to ensure that every Genie boom lift spends less time in the shop and more time out on rent. The new Genie protocol also standardises maintenance processes across the entire Genie boom family product line, with more product families to follow suit in 2016. Download the new manual for Genie S- and Z-boom lifts at genielift.com or order a hard copy using service part number 1268489.